In the past, the Rhinelands meant an area on both banks of the Rhine in central Europe. But now, the Rhineland (or Rheinland in German) has become a general word for areas of Germany along the middle and lower Rhine. It borders Luxembourg, Belgium and the Netherlands to the west, and the Rhine to the east. 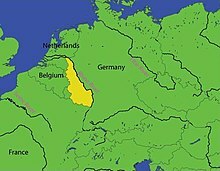 After the French were defeated in the early 19th century, the German and Dutch speaking areas at the middle and lower Rhine were added to the Kingdom of Prussia. The area was called Rhine Province (also known as Rhenish Prussia). After World War I of the early 20th century, the western part of Rhineland was under Entente control, and demilitarized (no military activities allowed) under the Treaty of Versailles. German forces sent armies back to it in 1936, three years before World War II. ↑ Dickinson, Robert E. (1964). Germany: A regional and economic geography (2nd ed.). London: Methuen. pp. 357f. ASIN B000IOFSEQ. Wikimedia Commons has media related to Rhineland. This page was last changed on 28 July 2017, at 15:16.